Hotel Leonardo Airport Schoenefeld, Berlin. Leonardo Airport Schoenefeld Hotel Berlin. Are you going to do a travel to Berlin both for business or pleasure trips? 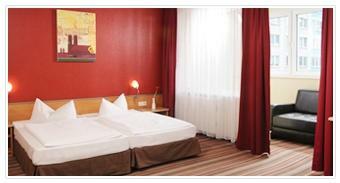 The "Leonardo Airport Hotel Berlin Schönefeld" is the perfect choice for you. Modern, comfortable, welcoming and warm hotel, where you can feel like in your own home. Here you will be encircled by every comfort and discover a big variety of excellent services. The "Leonardo Airport Hotel Berlin Schönefeld" lies in a strategic situation, at a few minutes from the airport and public means of transport. Berlin is easily reachable, so it is the ideal departure place for your excursions or visits to the capital. The hotel has 151 rooms characterized by a splendid design and provided with the most modern comforts. There are also 6 meeting rooms, for your conferences or other events. The structure offers a beautiful breakfast room and during the hot season you can have breakfast in our terrace with garden. In the morning you can start your day with the right energy with our abundant British breakfast. In the evening you can taste delicious local dishes. You can relax and enjoy our wellness centre with sauna, bio sauna, Turkish bath and relaxing area. Discover Berlin and its area! Thanks to our optimal situation in the south of the green Berlin, you can choose attracting destination easily and quickly reachable.